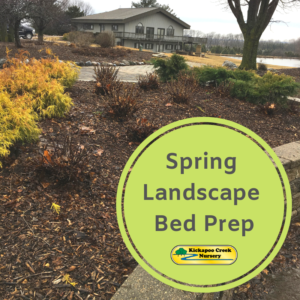 After a long, cold winter landscape beds can look drab. With a little time and effort those drab beds can be looking fresh and ready for spring in no time! After the beds have been cleaned up a bit, it wouldn’t hurt to fertilize any existing plant material. I recommend applying a slow release granular fertilizer around the base of the plant, or use fertilizer stakes that can be driven into the ground around the plants roots. Be careful not to get the fertilizer too close to any stems! Some fertilizers can burn new growth and stems if it is resting directly on them. To prevent any burning, carefully follow the application directions on the packaging! Generally it’s a good idea to spread the fertilizer at the “drip zone.” The drip zone is the area where rain drips off of the foliage of the plant and onto the ground. To finish tidying up your landscape beds it is sometimes a good idea to reapply rock or mulch as needed. Older layers of mulch can become sun bleached, decompose, or are moved by wind, rain, or animals. Applying a fresh layer of mulch can really make a difference in how your landscape beds look! Now sit back, relax, and enjoy your hard work! !